I love this town. Not only is Ocean Beach one of my favorite places on Fire Island, but it’s one of my favorite places on Long Island, period. Things resonate with people in different ways and I’m no exception, but there’s no doubt that this town is the “must see” place on Fire Island. From my own personal perspective, I’ve had some great times in here and that clinches it for me. Ocean Beach is the largest and most popular town on Fire Island. More houses, more shops, more restaurants, more real estate offices, more of everything including people make this town the “capital” of Fire Island. The main strip (Bay Walk, right) in the commercial district is practically a full time street festival. 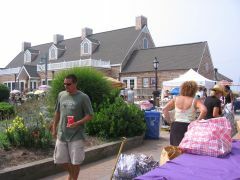 Shops, pubs and restaurants draw crowds in and the sun and salt air energize them. 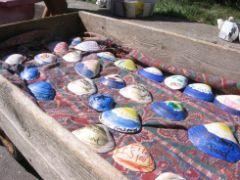 You’ll see children on the sidewalk selling hand painted seashells and other homemade treasures that are hard to resist. The sidewalk medians are planted tall and wide with flowers and nobody bumps into you without apologizing (most of the time anyway). If you’ve never been to Ocean Beach before you’ll be amazed at the number of bicycles and wagons. There’s even a wagon parking lot next to the ferry dock. Without cars wagons are the only way to carry stuff around and bicycles are the fastest way to get around. Also next to the ferry dock are public basketball courts, a recreation room with ping-pong tables, and the dockmaster’s office. Speaking of bikes, a bike tour is an excellent way to see Ocean Beach. You can rent bikes at the hardware store and ride from Ocean Beach through Seaview and Ocean Bay Park all the way to Point O’Woods. Turn down any one of the sidewalks leading to the ocean and Ocean Beach instantly transforms from hustle and bustle to sea of tranquility. You’ll hear little but birds, occasional laughter and the ringing of bicycle bells. 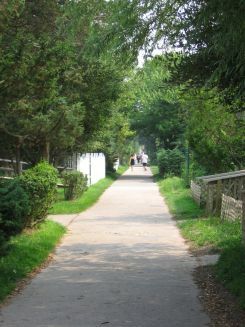 Left: Peaceful tree-lined walks lead from the commercial district to the Atlantic Ocean. Beautiful homes line the walks and very few people make the short walk to the ocean without muttering to themselves something about how much they’d like to live here. The recently rebuilt Ocean Beach community center (below) is the largest building in the business district and is right on the bay. 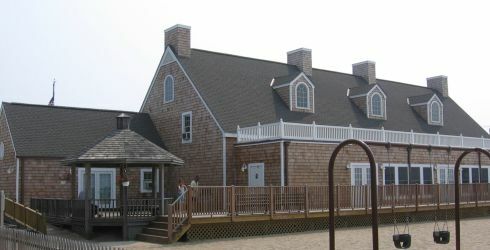 The center houses a theater for plays and movies, a courthouse and the Ocean Beach Historical Society. The historical society is not the dusty relic you’re probably picturing and neither is its young and energetic curator, Sarah Morgan. Sarah is doing an excellent job of keeping things fresh with new displays and events all summer long. The Ocean Beach Historical Society is open on weekends and Sarah is always happy to answer your questions. Be sure to stop in and say hello. In front of the community center is a children’s playground and a boardwalk promenade with benches facing the bay. This is an excellent place to relax with your kids at the end of the day and watch a beautiful summer sunset. At sunset the breeze slows down and calm envelopes the town. There’s nothing better than a cocktail at sundown at one of Ocean Beach’s bay front restaurants and A slow, relaxed meal in the company of good friends or family is a perfect way to spend the evening. Maguire’s at the western end of Bay Walk is one of my favorite restaurants for dinner on the bay. The food and service there are consistently good and I’ve become a fan of their Signature Salad. But that’s not the only place to eat. I’ve heard that The Hideaway is superb (expensive though) and I’ve had some decent food at the Island Mermaid. The best way to decide where to eat or drink in Ocean Beach is too walk around and look. All the restaurants have their menus posted outside so you can get a feel for the flavors and prices before you walk in. And don’t forget to visit Rachel’s Fire Island Bakery for desert or breakfast. If I’m just after a few drinks I go to either the Island Mermaid or Houser’s. The Island Mermaid has a nice flat screen TV over the bar and an excellent music collection that they’ve been building over the years. Houser’s is the kind of place you can go to straight from the beach. Not long ago I hiked from Atlantique to Seaview and then back to Ocean Beach. My date and I were exhausted, sunburned, barefoot, sandy and sweaty. We desperately needed some refreshment. I was wondering where the heck we could go looking the way we did, and then I saw Houser’s. When the bartender put those gin and tonics down in front of us I could swear they had halos around them and I could hear the angels sing. They were the best gin and tonics we’d ever had in our lives. If it’s nightlife you’re after Ocean Beach is the place. Everything is open late and the streets are just as lively at night as they are during the day. As for where to go and what to do I’m not going to name places. Just walk around and check things out. You’ll find a place that suits your fancy, guaranteed. Use the Fire Island water taxi if you’re already on Fire Island. The water taxis usually run on a loose hourly schedule that varies depending what town you’re in and their work load. Take the ferry from the Bay Shore ferry terminal at the end of Maple Avenue (4th Ave.) in Bay Shore. Please see the Ocean Beach ferry schedule for details. If you’re lucky enough to have your own boat then you can have a great time town hopping on Fire Island. At Ocean Beach there is a marina, but most of the slips are for private use. The 17 slips that are available for public use fill up fast and can get expensive if you’re planning an extended stay. Click the rate sheet at left for Ocean Beach marina rates and detailed information about visiting Ocean Beach by boat.